Let us enjoy the pAsuram and its meanings. iyalvAga …. muyalvAr iyal amarar – AzhwAr says that nithyasUris are the apt entities for serving emperumAn. The meaning for iyalvAga can be taken as “fit” or as “by nature”. For the others [samsAris, those who dwell in materialistic realm], it is a cycle of taking births in various forms (and bodies) due to bad deeds, getting involved with worldly matters and at some point of time, by the mercy of emperumAn, getting engaged with matters concerning emperumAn. However, for nithyasUris, their involvement with emperumAn is due to their nature. In thuzhAyAn – emperumAn adorns thuLasi garland to display his aiSvaryam – that he is the Lord of both nithya vibhUthi [spiritual realm] and leelA vibhUthi [materialistic realm]. adikkE sella – in order to attain his divine feet. 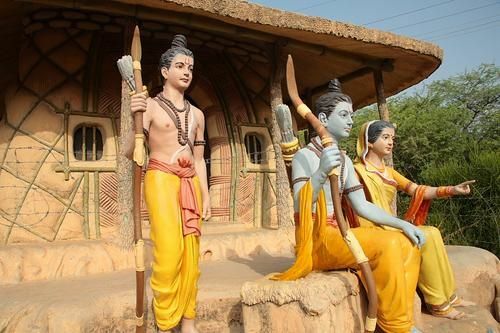 SrI rAma tells lakshmaNa in SrI rAmAyaNam ayOdhyA kANdam 16-29 “bhAvagyEna kruthagyEna dharmagyEna cha lakshmaNa I thvayA puthrENa dharmAthmA nasamvruththa: pithA mama” (Oh lakshmaNa! My father is not dead as he has as his son, one who knows my mind, one who knows (dhaSaratha’s) activities, one who knows the customs of servitorship) [in other words, lakshmaNa is all these to SrI rAma]. The nithyasUris also carry out tasks as per emperumAn’s mind. muyalvAr iyal amarar munnam – nithyasUris are capable, on their own, to take the initiative and serve emperumAn. lakshmaNa says in SrI rAmAyaNa ayOdhyA kAndam 31-25 “aham sarvam karishyAmi jAgratha: svapathaScha thE” (I will carry out all kainkaryam (services) to you when you are awake and asleep). nithyasUris will also carry out all kainkaryams. Is it only nithyasUris who can carry out all services to emperumAn? AzhwAr says that he will create opportunities for us (the jIvAthmAs) to attain him [and serve him]. iyalvAga – in an appropriate way; reciting his divine names as per SAsthram; to learn vEdhas by carrying various penances as ordained in SAsthras. niyamangaLAl parava – to be ecstatic after knowing about emperumAn through SravaNam (hearing), mananam (thinking about what was heard) and nidhidhyAsanam (meditating continuously about emperumAn) as ordained in SAsthras. krishNa says in SrI bhagavath gIthA 9-24 “aham hi sarva yagyAnAm bhOkthA cha prabhurEvacha” (only I am worshipped in all yAgams (spiritual rituals) and I am the one who gives benefits out of those rituals) and in 10-8 “aham sarvasya prabhavO maththassarvam pravarthathE” (I am the cause of all creations and all entities function because of me). There is no difference between nithyasUris and other chEthanas (sentient entities) as far as their relationship with emperumAn is concerned. We shall move on to the 14th pAsuram. This entry was posted in iyaRpA, mudhal thiruvandhAdhi on June 22, 2017 by T N Krishnan.